Entrepreneur, motivator, mentor and community advocate, Gina Linn Espinoza is one of Hispanic Lifestyle’s 2013 Latinas of Influence. Gina Linn Espinoza, aka Doctora Love, founder of UpLatino and Get Wise Latinas is dedicated to growing and nurturing talent as a personal success and life coach and motivational speaker. Given her diverse corporate management experience and energetic, positive thinking approach, Gina believes that the spirit of mankind, our diverse lives and shared history propel each of us forward creating a boundless untapped potential. UpLatino and Get Wise Latinas: Serving Latinos in finding meaningful, inspirational & motivational content & significant role models among our own demographic. Gina Linn was selected on of 22 Latinas Nationwide as a recipient of the 2008 National Hispana Leadership Institute Fellowship, attending JFK School of Government at Harvard University. 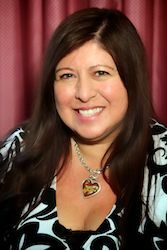 Gina Linn lives in Los Angeles with her little angel dog Don Pepe’…who is characterize in her Children’s programs “las aventuras de Don Pepe’, teaching tolerance and coping skills; Don Pepe’ is the little dog that hears with his ears but think with his heart. Gina Linn loves the arts and works pro bono with artists of all walks to help them develop business sense balanced with their extraordinary talents; believing that art does make all difference. Gina Linn has learned to marry her love of personal develppment and theater to produce many events like: the anniversary theatrical play and gala for Josefina Lopez’s award winning play “Real Women Have Curves” at CASA 0101. She also produced a Rock Opera about her favorite holiday, Dia de los Muertos/Day of the Dead at the Million Dollar Theater in Los Angeles, The Imaginary Life of the Street Sweeper August G at CASA 0101 and The TriTone Music and Art Festival. She is a Board Member CASA 0101Theater in East Los Angeles and serves as Vice President of Thirteen Senses, a non-for-profit t that she co-founded with author Victor Villasenor. She is on the board of the Finacially Fit Foundation and is a participant with Las Comadres para las Américas. In her spare time Gina is also a folk artist and craftswoman depicting her philosophy into her art and sprit by reclaiming and finding… beauty in everything! Ask Gina Linn for her advice and she will reply: Chose LOVE. -Alpha Pi Sigma Inc. San Diego State University, Mixing it up with LOVE How to take what you learned in school, and what you learn in life; mix it with LOVE and make it work for YOU!, CalPoly Pomona, Celebrating, Cultura, Orgullo y Pasión. -San Diego MANA “Words for Life” is an empowerment and motivational event designed to give you renewed confidence and vision to achieve your best life now. -The USO – San Diego . Creating what is today still as the most attended event in San Diego USO history. “Beauty from the inside out” ; Directly following the months after 911 working pro bono for 2 years with the families called to duty for our Country.